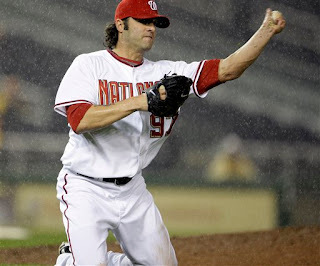 Joe Beimel makes a nice play, diving and slipping on the wet turf last night at Nationals Park, and injuries himself. Result: 15 Days On The Disabled List for our most effective reliever. Saul Rivera with the immediate return to DC. Washington just can't catch a break. Manager and Vice President of Baseball Operations Mike Rizzo made the announcement. his big-league debut in 2006. His 221 career relief appearances and 45 holds rank third in club annals (2005-current). Rivera signedwith Washington as a minor-league free agent on November 18, 2005. Atlanta. In eight relief appearances this season, he owns four holds and a 1.23 ERA. The 32-year-old signed with the Nationals as a free agent on March 18. Is Rivera the only pitcher in the world the entire minor league system they could bring up?? I would love to hear from someone who is an expert on our minor league options. Maybe if they didn't choose to play in a rainstorm, Beimel doesn't get hurt. yazzy1956--that's a good question, but I think this decision is totally based on Rivera already being on the 40-Man Roster. I am not sure if this is 100% correct, but I believe since Saul is now recalled before 20 days have expired--Washington saves the option for this year--at this point in time. If they send him down again this season, that option (based on a yearly period) will be extinguished if he remains in the minors for 20 or more days. But, if by chance, Rivera comes up tonight and is lights out the rest of the way (and I am not saying he will) then Washington can use this option next season--if they so desire. Not defending the move, I think it's deciding what's best for the moment, to decide what's better for later.